Life, Doctor Who & Combom: Doctor Who Filming: HUGE SPOILER - Cyber-what? Doctor Who Filming: HUGE SPOILER - Cyber-what? Filming commenced today in a graveyard in Llanelli (Previously used in The Angels Take Manhattan). Seen on set were several regulars including Peter Capaldi, Jenna Coleman and Samuel Anderson, joined with them were the Cybermen, who were seen filming in Cardiff yesterday. Along with them though was the revelation of a pretty big spoiler, which is listed under the 'Read More' to protect any spoilerphobes eyes. As seen below, the two main cast, joined by regular Samuel Anderson were on set, but Anderson (Danny Pink) was not in his usual get-up: He was in a cybersuit. 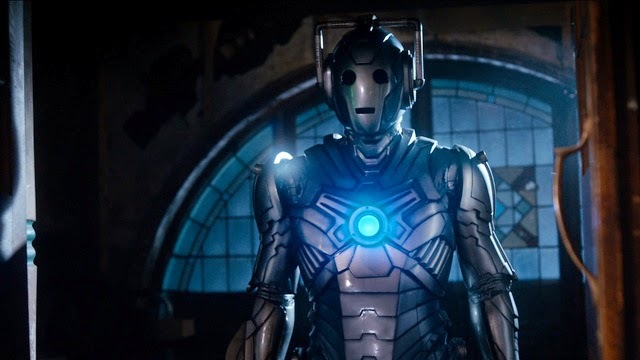 Sneaky fans managed to catch a glimpse of not only who was in the cybersuit but also a scene which took place involving Clara talking to the the cybersuit, which had no face-mask on and was in reality Danny Pink. Edit: The BBC have requested the photograph be removed.